Welcome to part 10 of the blog series titled "Reflections of the Great Lakes." The series features my jewelry and works of art, occasionally along with images of paintings by kindred artists. The stories pay hommage to the spirit and fascinating beauty and majesty of GICHIGAMIIN, the Great Lakes of Turtle Island (North America), and thematically connect the jewelry and artwork displayed with the Seven Grandfather teachings of the Ojibwe Anishinaabeg People who for many generations have lived close to the Lakes' shores to survive. 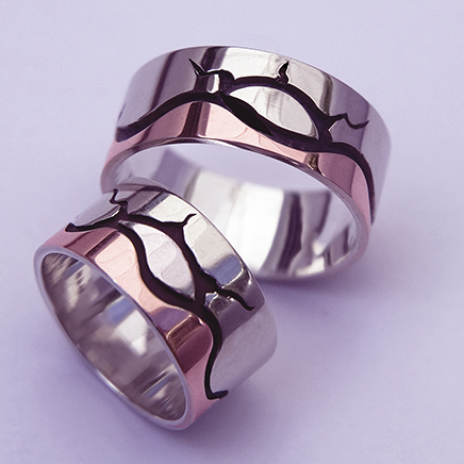 Today's story features a set of gold and silver overlay wedding rings made by hand in my studio. Feel free to visit the wedding ring page to view prices and shipping details. The distinct graphic overlay design of this set of overlay wedding rings titled Bangishimon Gichigamiing ("There is a sunset at the Great Lake") reflects the land of vast forests and lakes that for many centuries has been inhabited by my ancestors, the Baawitigo-Ojibwe-Anishinaabeg from Michigan’s Upper Peninsula. The design is reminiscent of the characteristic graphic “outline drawing” style of the Canadian Medicine painters, kindred artists who paint in the discipline of the Native woodland School of Art. The wedding rings feature a stylized image of the waves of Gichi-ogimaa-gami, the great lake that today is known as Lake Superior. The white gold of the ring surfaces depicts the light of Gimishoomisinaan Giizis, the grandfather of all Life on earth as he rises each morning in the east to perform his ritual dance across the southern sky; the red color of the waves represents his warm glow coloring the Great Lake red as he sinks in the water at the end of each day; the outlined waves of the Lake and the beams of the setting sun – the bottom layer of silver that shows through the cutouts in the surface of the rings – have been oxidized (blackened) in order to accentuate the (picto)graphic character of the ring designs. Giiwenh. So goes the Teaching Story about the Sunset at the Great Lake... such is the story of the wedding rings. Miigwech gibizindaw noongom mii dash gidaadizookoon. Thank you for listening to my storytelling today. Giga-waabamin wayiiba, I hope to see you again soon. Click here to read the first episode in the Spirit of the Great Lakes series, which centers around the incredible story of the courageous Mother Earth Water Walkers and showcases several paintings by Simone McLeod, artwork by Leland Bell, and a pen-and-ink drawing and a gold pendant by myself. Zhaawano Giizhik, an American currently living in the Netherlands, was born in 1959 in North Carolina, USA. 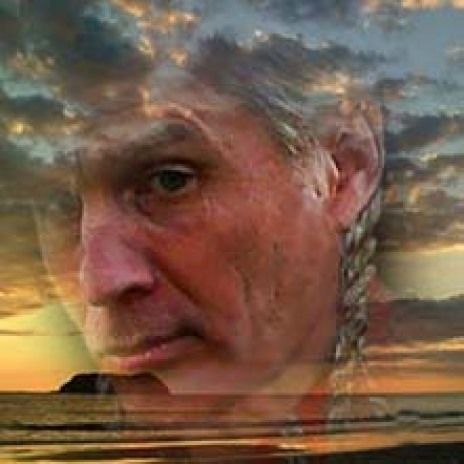 Zhaawano has Anishinaabe blood running through his veins; the doodem of his ancestors from Baawitigong (Sault Ste. Marie, Upper Michigan) is Waabizheshi, Marten. As an artist and a writer and a jewelry designer, Zhaawano draws on the oral and pictorial traditions of his ancestors. For this he calls on his manidoo-minjimandamowin, or "Spirit Memory"; which means he tries to remember the knowledge and the lessons of his ancestors. In doing so he sometimes works together with kindred artists.